The Admin Express page is always available at that URL. If TLS is enabled on the Administration Server, then the URL must use the prefix https with the same port number. The standard HTTP URLs will not work. On the main Admin Express page, there are buttons to turn servers off and on. 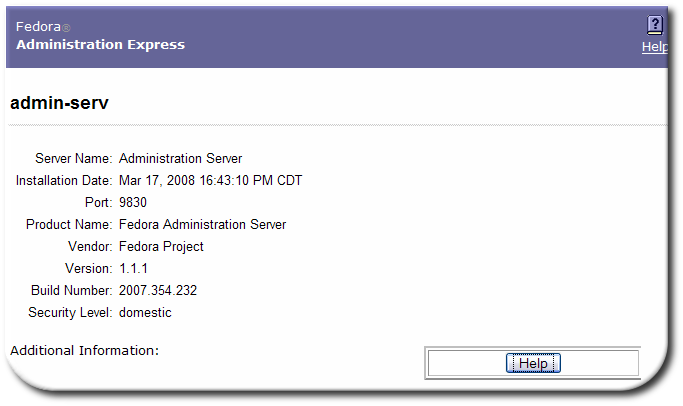 If either the Administration Server or the Configuration Directory Server is turned off through the Admin Express page, then it must be restarted through the command line, not through the Admin Express On/Off buttons because Admin Express requires access to both the Administration Server and Configuration Directory Server in order to function. Other Directory Server instances can be safely stopped and restarted through Admin Express. Admin Express can show and search the access and error logs for Directory Server and Administration Server and the audit logs for the Directory Server. 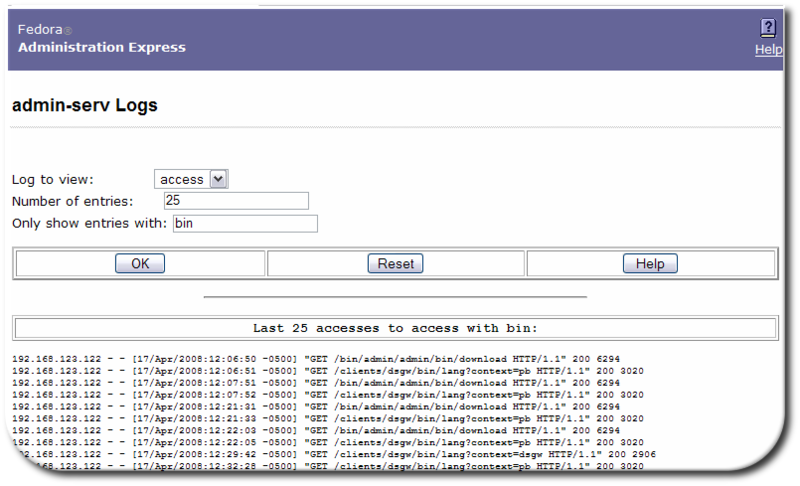 In the Admin Express page, click the Logs link by the server name. Select which log type to view, how many lines to return, and any string to search for, and click OK. The Server Info link on the Admin Express page opens a page with the basic description of the server instance, such as the build number, installation date, and server port number. This is the same information displayed in the Console when an instance is selected. The Directory Server information is located in the /etc/dirsrv/slapd-instance/dse.ldif file; the Administration Server information is located in .conf files in the /etc/dirsrv/admin-serv directory.